Selecting the right bike locker depends on many factors. This guide will help you make the best decision when buying bike lockers for your site. The main advantage of bicycle lockers is that they meet Class I long-term security for bike parking, defined as two hours or more and protecting the entire bicycle and accessories against theft and weather. Bike lockers provide dedicated individual access, offer the highest level of security, and encourage cycling as transportation. Both metal and fiberglass composite bike lockers are strong and durable. Plastic bike lockers are less durable. Fiberglass composite bike lockers are available with weatherproof polycarbonate panels that provide visibility into locker contents. Perforated metal lockers also provide visibility into the locker, but are not weatherproof. Coin operated locks are low security, vulnerable to break-ins and require regular maintenance to collect coins. Not recommended. User hasp locks are low security because the lock can be cut off. Recommended for areas of low concern of vandalism. Medium-security vendor-style locks can be used at medium security sites. Chicago is a recommended brand. Built-in T-handle bike locker locks are high-grade vault type locks recommended for highest security. Abloy is a recommended brand. Consider keys that are not duplicable. Master key systems are available for management control. Promotes regular use with a dedicated space. Requires administration. Lockers can be equipped with electronic access for locker rental and dedicated use. Available with key fob, HID card, or numeric keypad, electronic access can be costly to install yet has the benefits of increasing availability and better locker management. Fiberglass composite bike lockers with high security T-handle locks, polycarbonate windows and electronic access. Some bike lockers have only a single door for storing one or two bikes. More space efficient lockers offer a door on each end, enabling independent access for two bikes. Modular bike lockers can be ganged together to create space-efficient bike parking that fits your location. Double-tier bike lockers can be stacked to increase the number of bicycles parked per square foot. Each locker occupies a space of about 42” by 78”. Bike locker space requirements can be reduced by installing modular lockers side by side so they share common dividers, or by stacking the lockers. Six-foot aisles are recommended in front of bike locker doors. Ensure the bike locker door is wide enough to fit bikes with wider handlebars, and the interior dimensions can accommodate electric bikes or larger bikes. Two-sided bike locker showing two doors, partition, and two bikes. Fiberglass composite bike lockers offer 30% less weight compared to metal lockers, making shipping more economical and easier assembly and relocation. Structural compression molded composite (SMC) is a closed-molded process that produces uniform parts forged with heat and pressure for increased impact strength and puncture resistance with molded ribs and bosses for highest security. Compression moldeding also reduces material waste. SMC offers the strength of structural steel without the weight, has high surface hardness, and is UV and fire resistant. Integral base color. No painting is necessary so color will not delaminate, chip or fade. SMC is comprised of raw materials that have recycled content, and closed compression molding processes control VOC emissions, for a greener manufacturing process. SMC is a corrosion-free material that stands up to harsh environments, and will not conduct heat, cold or electricity as with metal lockers. 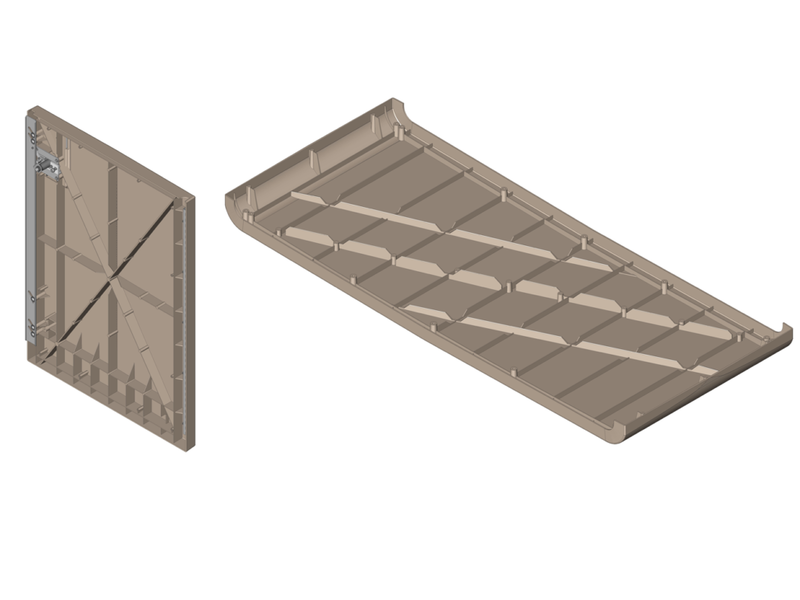 Lightweight panels allow for less assembly time and less manpower required for assembly. The extended life of SMC composites gives high return on investment. Fiberglass composite door and top panel with structural ribs for strength and security. Fiber-reinforced laminate is an open-molded process with reinforced fibers sprayed into a single-side mold. Material thickness varies per unit, compromising material strength. Offers moderate security with thinner wall construction. Offers some recycled content, but because the fiber-reinforced laminate manufacturing process does not control VOC emission it is not recommended for environmental standards. Ordinary fiberglass bike lockers can become chalky, dirt will stick to them, and they can grow fungus and algae on surfaces. CycleSafe’s SMC compression molded fiberglass avoids these issues. Metal bike lockers are very heavy, which makes shipping expensive and relocation difficult. Can offer high security because of the strength of steel. On hot days, the interior of a metal bike locker can get very hot, which can harm bicycle components or accessories. Metal bike lockers can have sharp edges which can be a safety concern. Rather than transparent panels, many metal bike lockers come with perforations that can allow water and insect entry. Powder coated steel will eventually dent, scratch, chip and rust. Stainless steel resists corrosion, but is more expensive than regular steel. Metal bike lockers can be high maintenance because of rust. Plastic bike lockers are made of one resin (polythylene) and are not recommended because of their low structural quality and appearance. Plastic bike lockers are highly flammable and not recommended for public spaces. Plastic is easily cut or etched into with a pen knife. Typically equipped with low-quality locking systems. Consider a bike locker design that can be either mounted to a concrete pad, or mounted on rails for easy relocation. Ensure the locker is easy to assemble or relocate. Bike lockers that ship ready to assemble are less expensive to ship than fully assembled lockers. Metal bike lockers will require painting to deter rust. Look for materials and coatings that offer graffiti or UV resistance. Look for a curved roof line that will shed rainfall and not collect water and dirt. Modular bike lockers allow individual components to be repaired or replaced without having to pay for a whole new locker if severe damage occurs. Most fiberglass composite lockers have radial edges with a contemporary design. Metal bike lockers may have sharp edges or corners. Look for a modular, interlocking design to avoid misalignments. Look for gaps that might collect debris. Fiberglass composite bike lockers with radial edges and contemporary design. Door or side panel windows so that locker contents are visible. Side display panels for wayfinding, marketing, or revenue generation. Storage bins for cyclists gear. Coat hooks for clothing and gear. Numbered ID plates for easy locker identification. Conventional electrical outlet or solar charging stations for electric bikes or accessories. A door check that keeps the door open while accessing the locker. Consider enhancing your site with a public bike repair stand or public bike pump. For efficient bike locker operations, consider bike locker support tools such as key management systems or electronic access systems for booking, payment and remote access. Bike locker with display panel for wayfinding, marketing, or revenue generation. Now that you know more about the range of possibilities in bike lockers, you know how to choose a bike locker with the best return on investment. Have a look at the full line of CycleSafe bicycle lockers to find one that suits your needs.